Sugoi Days: Starbucks Malaysia 's Christmas 2019 collection is here! 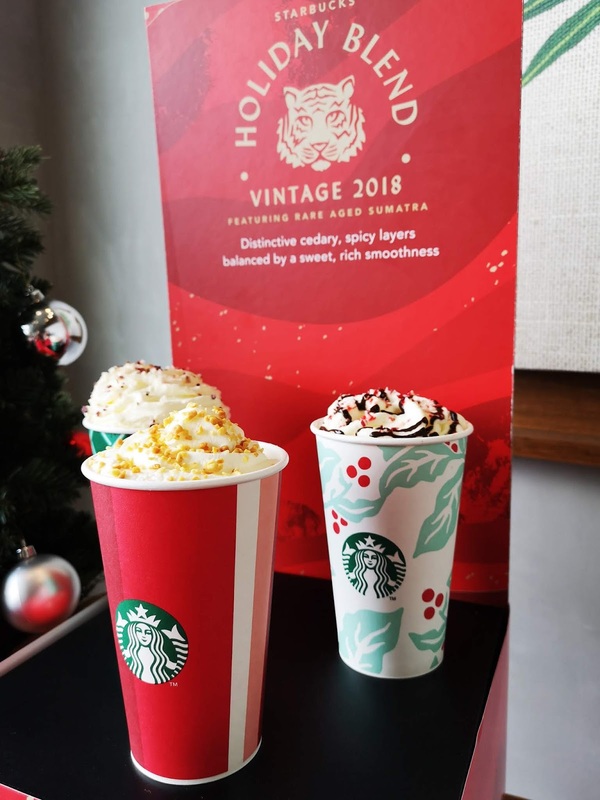 Starbucks Malaysia 's Christmas 2019 collection is here! I’ve said this before and I will say it again. I loveeeeee the year end holidays. I can feel myself getting excited in anticpation of the Christmas carols, decorations, and the food. And one of the things I look forward to each year is the Starbucks Christmas collection. This year is definitely no different with a new drink added to the mix. Oh my! Themed the ‘The Blend is The Magic’, Starbucks Malaysia’s Christmas range has already hit the stores as of 13 November giving you a good one month and a half to enjoy the all new Snowy Cranberry Latte. Starbucks has also brought back the good old holiday favourites - Toffee Nut Crunch Latte and the yummilicious Peppermint Mocha. - NEW! Starbucks® Snowy Cranberry Latte: Pairing the toastiness of white chocolate sauce with the sweet and tart notes of cranberry, the new Starbucks® Snowy Cranberry Latte is topped with snow-like whipped cream and sprinkled with cranberry sugar. Old fans will be reminded of the old Cranberry white chocolate they used to have. - RETURNING FAVORITE! Starbucks® Toffee Nut Crunch Latte: Subtle caramelly sweetness of the Starbucks® Toffee Nut Crunch Latte, topped with whipped cream and a sticky toffee crunch makes the perfect partner for Starbucks® espresso roast. - RETURNING FAVORITE! Starbucks® Peppermint Mocha: Indulge in the traditional holiday flavors of the Peppermint Mocha, a combination of espresso and steamed milk sweetened with flavors of chocolate and peppermint. Topped with whipped cream, mocha drizzle and candy cane pieces. And of course what is the Year end holiday without the Starbucks 2019 Planner, redeemable from 20 November onwards with the purchase of any three Grande or Venti-sized Starbucks Holiday Beverages, and 12 other Grande or Venti-sized of any Starbucks handcrafted beverages made from 13th November onwards. Starbucks also has their holiday gift cards for the loyal Starbucks fans. Available at all stores from 13th November, the Starbucks® Snowy Cranberry Latte, Starbucks® Toffee Nut Crunch Latte and Starbucks® Peppermint Mocha are priced at RM17 onwards. The Starbucks® Holiday Blend, Starbucks® Holiday Blend Espresso Roast and Starbucks® Holiday Blonde Roast are priced at RM40 onwards, while the Starbucks® Holiday merchandise collection will be available in stores starting 13th November onwards. For more information, please visit Starbucks Malaysia website at www.starbucks.com.my.